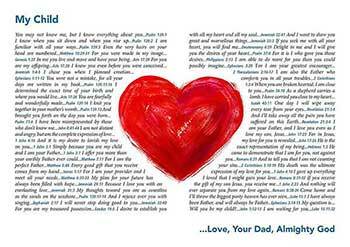 A campaign to share the Father's Love Letter with every household in the UK is launching on Valentine's Day. The popular Father's Love Letter, written by Barry Adams in 1999, is a collection of Bible verses that show people the love God has for each and every person. Since 2007 around 540,000 copies have been given away throughout Scotland, and 75,000 homes in Southend were visited and given a copy. Wendy Thomas, who is coordinating the plans, comments, "The Father's Love Letter is a great way of sharing the love that God has for people. "Through direct quotes from the Bible it helps people understand that God is not angry with them but rather is a loving Father, who has a plan and purpose for each and every person. We really hope that churches will use this resource to help bless friends, family, neighbours and communities." On Valentines Day, 14 February, people are encouraged to share the Father's Love Letter image on social media platforms. The aim is for individuals, churches and Christian organisations to post the image, available from www.facebook.com/FathersLoveLetterUK, as a tool for starting discussions around the way God loves people. Copies of the Father's Love Letter are also available for groups to deliver by hand to neighbours, parishes or communities and it is suggested churches may also look at including the Father's Love Letter in church and community magazines. Resources for Valentine's Day including posters, cards and banners are available here from CPO.